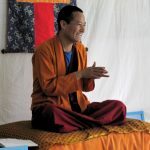 Lama Samten Yeshé Rinpoche teaches regularly in the cities of Arles, Carcassonne, Montpellier, Nîmes and Rogues. For the other one-off locations, please refer to the Agenda – Practice Days section. In Montpellier, yoga and meditation sessions are held weekly, in addition to lessons that take place on 3rd weekend of each month. Location: Center Tazig Samten Ling – 22, rue de la République, Montpellier (in front of St Roch train station, between Boulangerie and Le Magasin RedK). Information by phone at 07.83.38.96.89 or by email at takzigsamtenling@gmail.com . The MONTPELLIER center will be closed from Sunday, December 24 to Wednesday, January 3, 2018. Resumption of Tibetan yoga and meditation classes on Monday, January 8th. Rinpoche plans to give Tibetan yoga and meditation classes in Montpellier on Thursday from 12:30 to 1:30 pm. Interested persons are invited to contact the Tazig secretariat on 07 83 38 96 89 or by email at takzigsamtenling@gmail.com Do not hesitate to share the information. Thank you. In Arles, lessons are held on the 4 th Sunday of each month. Information: 06 85 96 40 61 or by mail: lanya.gc@gmail.com. In Carcassonne, lessons are held on the 2nd weekend. of each month. Saturday from 2 pm to 6.45 pm: lessons for beginners, yoga and meditation. Sundays from 10 am to 6 pm: lessons for advanced students. Information on 06 87 01 21 91 or by email: martine.rambeau123@orange.fr . In Lauris, lessons are held on the 4 th Saturday of each month. Information: 06 61 21 89 97. In Nîmes, Tibetan Yoga and meditation classes will take place on Wednesdays at the end of the day. – Information to come. In Pérols, Tibetan Yoga and meditation classes will take place every first Tuesday of the month from 12 September 2017, from 6 to 8 PM. Salle Kuyten (near the cooperative cellar). For more information, call Agnes : 06 16 63 94 71. 15 € per person – 20 € for a couple. Online membership, via PayPal (see the ” Shop “), or payment by check payable to: Association Tazig Samten Ling to be returned to Association Samten Ling – 22, rue de la République – 34000 Montpellier. Subscriptions are valid from the date of purchase. They are payable in 2 or 3 checks cashed in 3 months maximum. Any subscription implies membership to the Tazig Samten Ling association, the same applies to any participation in teaching or retreats. IMPORTANT: For the practice of yoga, it will be necessary to bring a medical certificate with the mention “Able to practice yoga“. – Without subscription: 10 € the course. – Trial course, yoga + meditation in the same evening: 15 €.